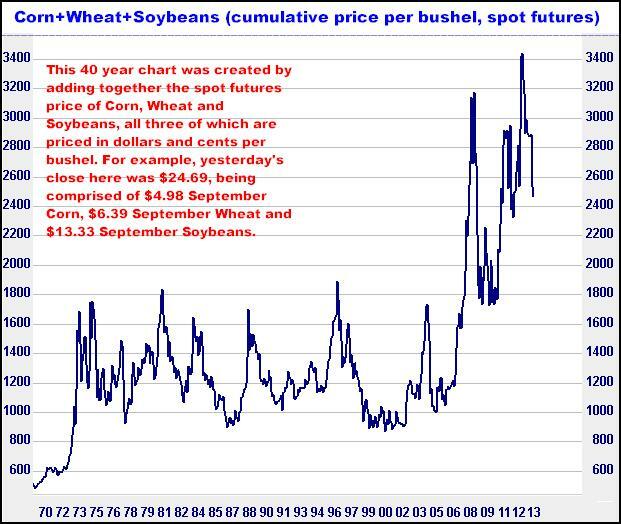 Last fall I put up the following cumulative chart of Corn, Wheat and Soybeans, in which the three markets could be seen in an “all in one” fashion . My very strong opinion was that all three were set to enter a lengthy period of steadily (sometimes quite rapidly) declining prices. And, now, a year later, I see ample evidence to suggest they have all begun protracted bear markets, and once again, I recommend being short all three…Just as the past few years have been marked by cries of, “We’re gonna run out!” (we didn’t), I think somewhere in the coming year you will be hearing, “We’ll never use it all!”, and expression that will be generated by prices having ultimately fallen FAR BELOW current levels…As this is the way it just seems to happen in this business, where nothing is ever at equilibrium, and where price EXTREMES are often the norm, I think there is a strong chance we will see prices that 95% of the today’s agricultural community would not even dream as being possible…under ANY circumstances. 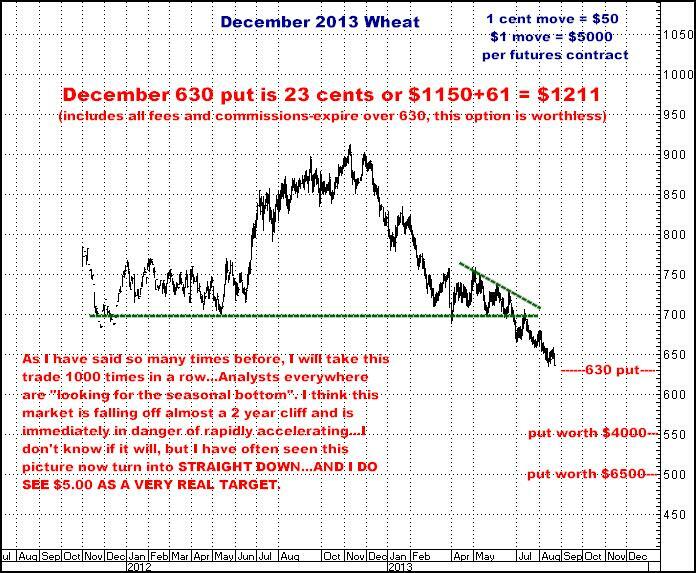 But let’s go to the chart…You decide for yourself if you think there is downside potential…. Okay…If you want to suppose that we are now in a new universe in which prices don’t swing up and down, I guess you can think something like, “Oh, well stay up here! China is a big buyer and all that…”, but I’ll strongly disagree. In a nutshell, high prices have forever spurred increased production, followed by eventually lower prices, and the evidence is, all over this planet, this is precisely what is happening once again. We’ve been through several years where everybody thought these markets were going to the moon, and like clockwork, farmers have planted (and are planting) every crop there is, and everywhere they can find the ground to do it on…and if experience is any guide at all, the chart above WILL do what it has done over and over following almost every bull run you see there…START DOWN AND KEEP GOING DOWN, A LOT, AND FOR AT LEAST 2-3 YEARS. In reality, Agriculture has spent recent years in an absolute boom…maybe even to the point you might call it a bubble…At any rate, believe me, there has been NO recession down on the farm, and I’m not saying the next thing is “bust”, but I do think we are headed towards a time when there are going to be a lot of farmers complaining, “Price CAN’T be this low. It’s under the cost of production!”. Or a time, when anyone who had purchased farm acreage in the last few years, finds themselves waiting a decade to see their sales prices matched again…To me, it’s just the way this stuff works. 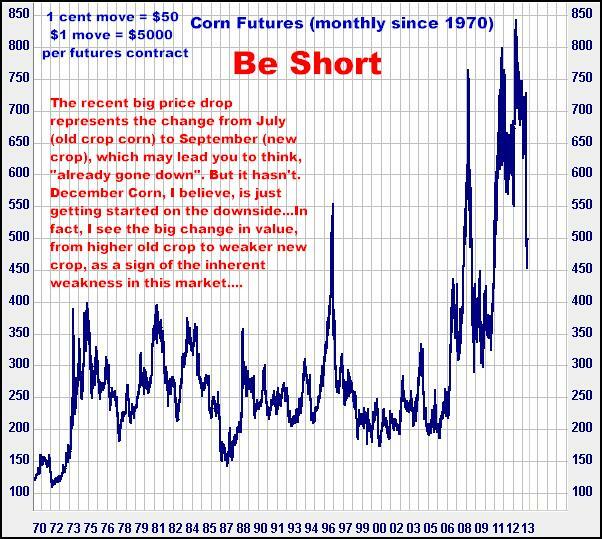 The markets go up until producers are absolutely giddy with cash and optimism, then go right back down again until some percentage of them get wiped out. I WILL TELL YOU STRAIGHT OUT THAT I HAVE NO IDEA IN WHAT ORDER THESE MARKETS WILL GET HIT (If I am right). They may all go down in unison, at equally fast rates, or what is more likely, one will be leading (as Wheat did earlier this year) while the other two drag along behind. Then one will stop and another may take the lead. The truth is, I may draw impressions like, “This one is next!” or “That one is dead for while”, but there is simply no way to make those short term calls…So my solution is: Just be on all of them, with puts, and stay on all of them. 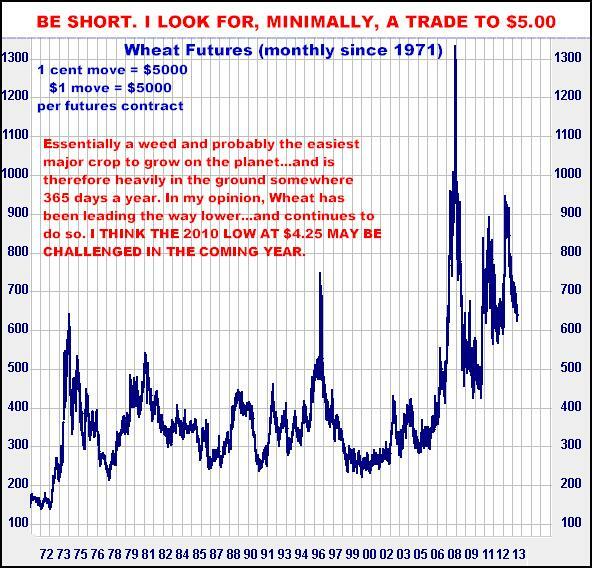 If I am right, there should be “yippee!” times while Wheat gets cracked, which may then be followed by just the same in Corn or Soybeans…or not…, the point being, there is NO WAY to know in what order or velocity these markets will move, so all I intend to do is trust that cumulative chart and the resulting common sense generalization that these three row crops DO tend to travel in the same direction…and that furthermore, if I do have all this right, there is the potential to make some very good money…I AM LOOKING FOR MULTI-DOLLAR MOVES ON THE DOWNSIDE…NOT PENNIES…As always, I have to add, if I am wrong, you will probably lose money. A recommendation like this (3 related markets) often inspires questions like, “Which one do like the most?”, or “Which one has the most potential?”, or “Which one do you think is ready right now?”, and my answer is a very loud, “I don’t know.” I like all three. My logical side tells me, unequivocally, to be on all three. I will tell you, don’t even begin to think about picking one, as inevitably, it’s the one that does nothing while the others FLY. Furthermore, if you own puts in all three, and only one works, and you are dead wrong on the other two, per the leverage in options, there is still a strong chance you will make money (obviously you might lose as well). 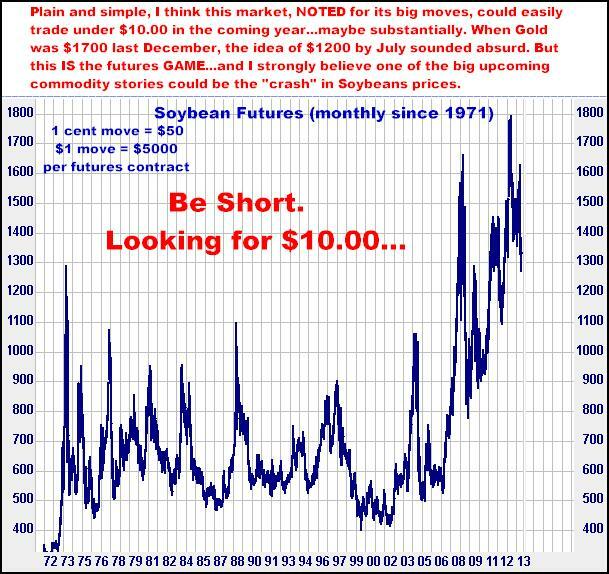 I sat on Short Corn and Soybeans for most of the past 9 months. For a while, it looked like this was going to work…in fact both markets were making new lows in April and I was all but certain the “crash” was coming…that the big money was right in front of us…and I was wrong. In retrospect, what I didn’t account for (I think) was the very late start (April and May) and difficulties in getting new crop Corn and Beans going during the summer resulted in Old Crop being well supported throughout the summer…meaning that the break down I was anticipating never materialized. 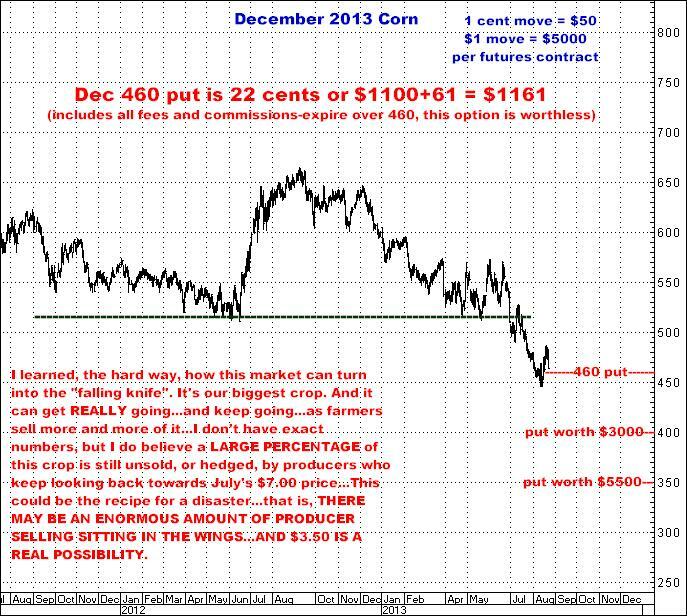 I don’t put that out there as anything even close to an “excuse” for being wrong, but simply to make the point I THINK THIS PAST SUMMER’S CROP PROBLEMS ONLY DELAYED THE INEVITABLE…AND THAT THE WHEAT, CORN AND SOYBEAN BEAR MARKETS I HAVE BEEN LOOKING FOR ARE NOW UNDERWAY…AND THEY WILL ALL BE UNDER SEVERE PRESSURE ALL THE WAY OUT TO NEXT SPRING OR SUMMER. 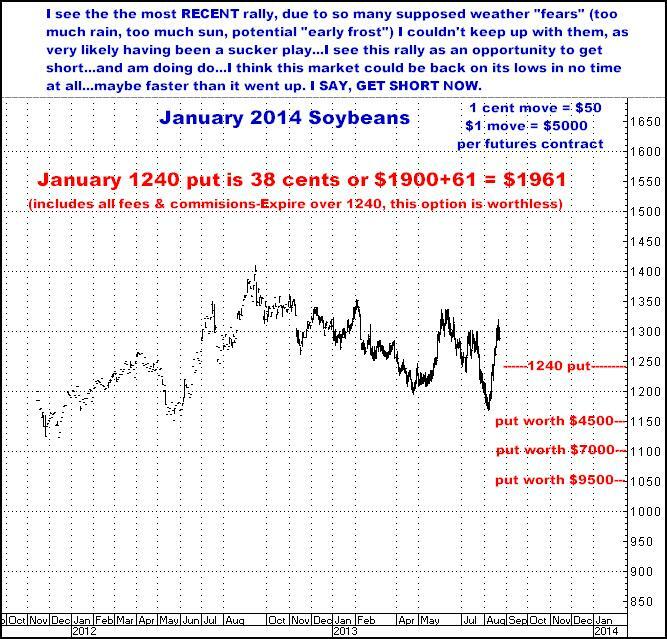 I RECOMMEND BUYING PUTS IN CORN, WHEAT AND SOYBEANS. I EXPECT TO BE SHORT ALL THREE FOR AT LEAST THE NEXT SIX MONTHS. All done for now…Maybe I’m wrong but I think this combo of trades has quite large potential. This idea started out working last year…but then fizzled…I have no way of knowing, but I think the outcome is going to be VERY different this time around…I LOVE THE LOOK OF THESE THREE MARKETS…DOES NOT MEAN I WILL BE RIGHT, WHICH WOULD MEAN A BOUT OF LOSING TRADES, BUT I THINK ALL THREE OF THESE HAVE A FANTASTIC LOOK…ALL VERY BEARISH AND APPEAR TO BE READY TO ACCELERATE. AGAIN, THIS IS ONLY MY OLD GUY OPINION. Give me a call if you think this looks promising…and I wouldn’t be banging away on this if I didn’t think this was already starting to happen.